The day before the event I upgraded my laptop to the RTM version of Windows 10, so the demo time during the session was a stressful one. Besides this, I have an amazing time, and the people at the room seems to enjoy my presentation also. I also had the chance to spend some quality family time in Tenerife, playing with Windows 10, drones, beach, running, Loro Parque and water attractions at Siam Park. So far I’m more tired than usual !!!! And of course, I must share a BIG THANKS to the TLP Innova team, to the attendes, the colleagues and friends, I really really love Tenerife. I get a couple of questions in Twitter about the materials, so I share an evolution/copy/paste of the stuff I already share in Andorra a couple of weeks ago. El día anterior actualicé a la version RTM de Windows 10 y claro, nada major que eso para jugar con fuego durante un evento. Eso sí, yo me lo pasé genial y parece que la gente también. Tuve la suerte de tener una gran excusa para pasar unos días en Tenerife con Pao, Valentino y Martina, y entre tanto Windows 10, drone, playita, Loro Parque y Siam Park, la verdad que me voy exhausto; no sin antes agradecer muchísimo a toda la gente que participó / coordinó las sesiones de la TLP Innova. Como alguno ya me ha hecho alguna pregunta en twitter sobre los materiales, pues dejo un evolution/copy/paste de lo que compartí en Andorra hace un tiempo. – La app Simple HID Writer se puede descargar desde aquí (link), gracias Jan Axelson !!! 2000 new technologies fans, 6 days 24 hours with increased connection of the country. More than 40,000 visitors will immerse in the world of comics, film, and Manga among others. 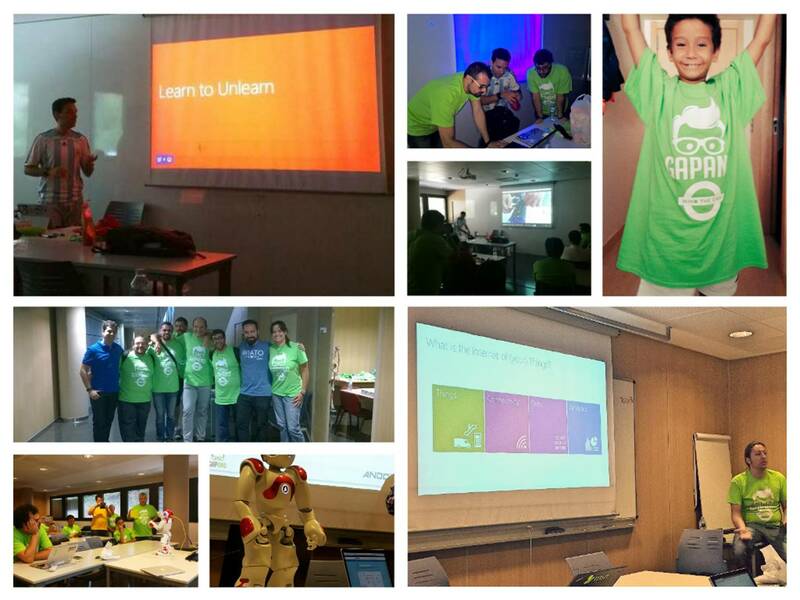 And in TLP Innova will enjoy more than 100 hours of training workshops and conferences of the best speakers. And a cool one, every related to TLP Innova is Free. So you only need to Review the agenda and Start choosing some sessions. 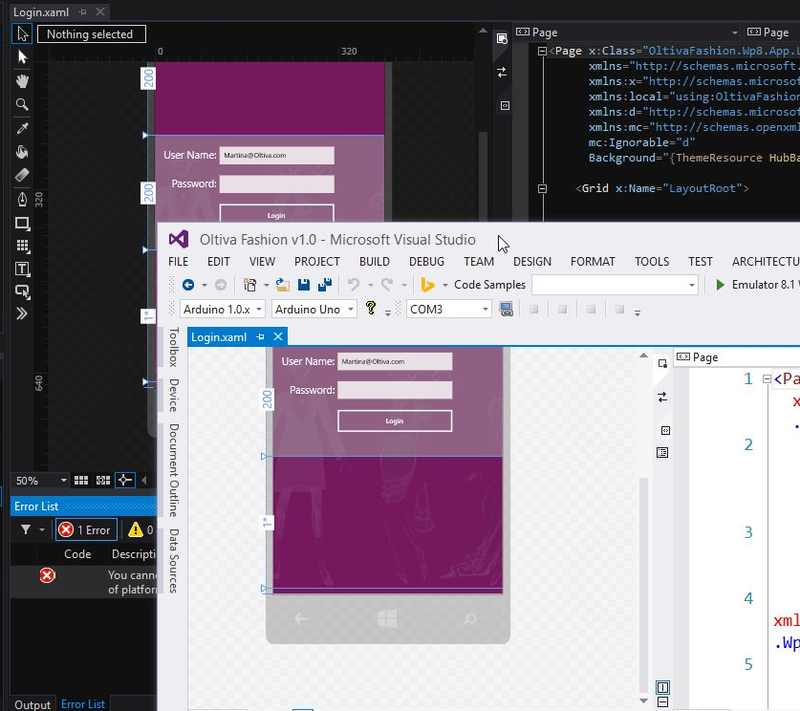 On Friday July 17th, from 16:00 to 17:00 I’ll be doing a new version of Coding4Fun 2.5, with some contents from Internet of Things, Windows 10, Visual Studio 2015, Drones, etc. Today Upgrade to latest versions on SO and VS ¿? 2000 aficionados a las nuevas tecnologías, 6 días 24 horas con la mayor conexión del país. Más de 40 mil visitantes se sumergirán en el mundo del Comic, Cine y Manga entre otros. Y en TLP Innova disfrutarás de más de 100 horas de formación con los talleres y conferencias de los mejores ponentes. 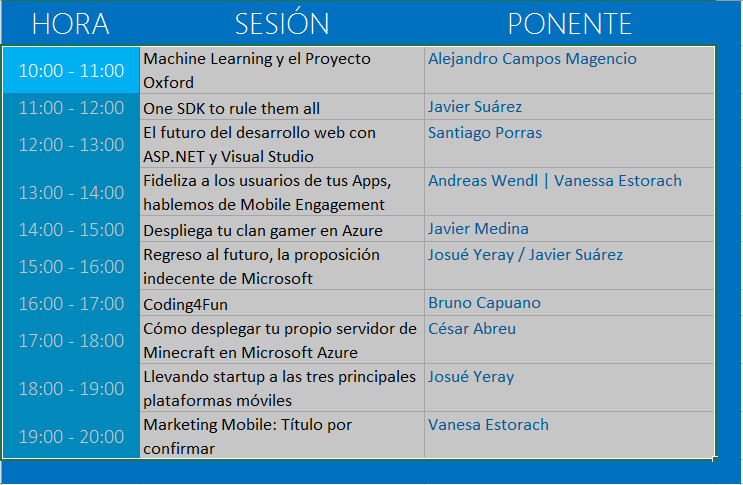 En mi caso, el próximo viernes 17 de Julio, de 16:00 a 17:00 estaré con Coding4Fun 2.5 compartiendo algunas ideas del mundo de Internet of Things, Windows 10, Visual Studio 2015, Drones, etc. Today Actualización a nuevas versiones de SO y VS ¿? Today was a great day, and we enjoyed a lot with tons of Friends in the Geek-A-Palooza event. So to all the people involved THANKS A LOT !!! Recién terminado el evento, es momento de agradecer a los amigotes de Geek-A-Palooza por el pedazo de evento que se han marcado, MUCHÍSIMAS GRACIAS !!! o Por ahora veré de instalar la build 10162 de Windows 10. Volveré a probar si el hackeo del bluetooth con el Parrot Rolling Spider ha vuelto a funcionar. I get this from my draft post so I can write a series of posts related to Bluetooth Low Energy and Windows Universal Apps. When you create Windows Universal Apps for Windows 10, you can deploy and use them in any kind of Windows 10 device (laptop, pc, phone, etc.). As an starting example, I’ll write a sample post on how to get heart rate information from a heart rate sensor. For this sample, I’ll use the heart rate band included with my Polar M400 (this is a smartwatch I use for running) Even if the user manual does not go deeply in the documentation, you can easily get that this is a Bluetooth Low Energy device. So we need to go navigate to [Settings // Devices // Bluetooth] and pair de device. 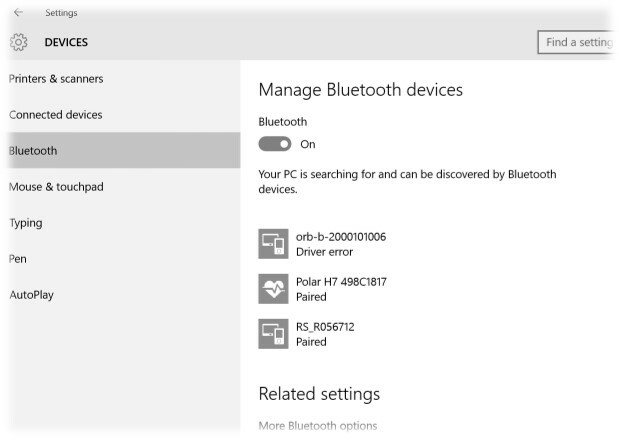 Windows will automatically identify the device as a “Hear Rate device” and the device to the Bluetooth devices list. In the next post I’ll share a simple Windows 10 Project which interactis with the device. Bonus: Windows Phone and Android views of the device. After running the 10 K race put a brake, now a little review what has been learned after using Blend 2015 for a couple of weeks. 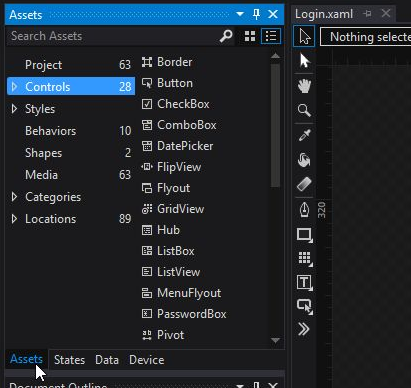 There are posts from the official Visual Studio Team where he discussed all of the new features, I’ll try to comment what I liked during this last time. Detail: Works including the ALT + SHIFT + ENTER for Full Screen! Now, it is still Blend, with what we have panels of Assets, States, etc. Those who already know of Blend, that is appreciated because in some respects it is much easier to continue working in mode UX. 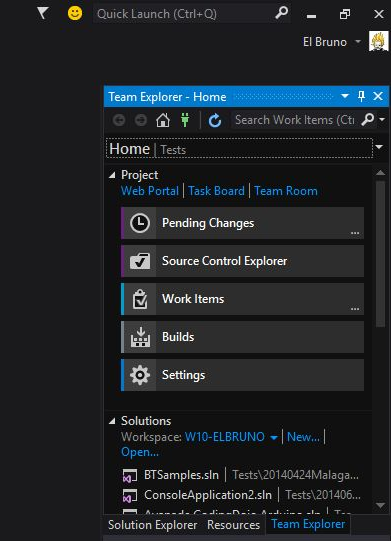 Another thing that caught my attention is that Solution Explorer and Team Explorer panels are exactly the same as in Visual Studio. This glad day when working with shared projects, or TFS and Git. A couple of things that I have not tested: If you are editing a project in Visual Studio 2015 and 2015 Blend, the process of refreshment of the modifications to a file between apps seems that it has greatly improved. I have not personally tried it, I do not usually have 2 apps open at the same time. Another thing I haven’t tried is the ability to debug from Blend. It is now exactly the same as in Visual Studio. Ahh and you don’t forget me: like to NuGet? as takes NuGet in Blend! Después de correr los 10K de la carrera ponle freno, ahora toca repasar un poco lo aprendido después de utilizar Blend 2015 durante un par de semanas. Hay posts del equipo oficial de Visual Studio donde comentan todas las novedades, yo intentaré comentar lo que me ha gustado durante este último tiempo. Detalle: Inclusive funciona el ALT + SHIFT + ENTER para el Full Screen !!! Ahora bien, sigue siendo Blend, con lo que tenemos los paneles de Assets, States, etc. Los que ya conocemos de Blend, eso se agradece porque en algunos aspectos es mucho más cómodo seguir trabajando en modo UX. Otra cosa que me ha llamado la atención es que los paneles de Solution Explorer y Team Explorer son exactamente los mismos que en Visual Studio. Esto nos alegra el día al trabajar con proyectos compartidos, o con TFS y Git. Un par de cosas que no he probado: Si estás editando un mismo proyecto en Visual Studio 2015 y Blend 2015, el proceso de refresco de las modificaciones en un archivo entre las apps parece que ha mejorado mucho. Personalmente no lo he probado, no suelo tener abiertas las 2 apps al mismo tiempo. Otra cosa que no he probado es la capacidad de depurar desde Blend. Ahora es exactamente igual que en Visual Studio. Ahh y que no me olvide: Quieres NuGet? pues toma NuGet en Blend !! !